"I would never presume to jump into somebody else's franchise, not at all." Doctor Who is Matt Smith's role. Update: 16th February 2012. The Celeb Factory. Update: 5th March 2012. Cosmopolitan UK interview. Update: 31st May 2012. Blockbuster UK interview. Update: 6th October 2013. Interview which aired in China added. 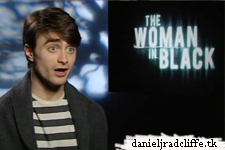 Then Daniel will introduce two screenings in London this Saturday 11th February. He will do this together with James Watkins. These are 3 p.m - Empire Leicester Square and 4:30 p.m. - Vue Westfield. So fans from London, If you want and can be there.. get your chance!